Just a quick trip across the iconic Brooklyn Bridge from Manhattan, Brooklyn is Manhattan’s neighbor and a city with its own vibe and attractions. Hotels and bed and breakfast accommodations are generally cheaper than in Manhattan but no less comfortable or luxurious. What they all have in common is an appreciation for Brooklyn’s unique history and culture that strongly reflects its architecture and art. Located in Brooklyn Bridge Park on the East River waterfront, 1 Hotel Brooklyn Bridge is a trendy industrial chic boutique hotel with unique range of suites with thoughtful details such as reclaimed wood, hemp-blend mattresses, and organic cotton sheets. All rooms have free Wi-Fi, flat screen TVs, private bathrooms, mini bars, Nespresso machines, yoga mats, and much more. Suites also have sofa beds and living areas, and larger suites have lounges, dining areas, soaking tubs, and complimentary bikes on loan. The view of the Manhattan skyline is spectacular from most rooms. The hotel has the popular Osprey restaurant, rooftop bar, a gym, a screening room, and a luxury Bamford Haybarn Spa. 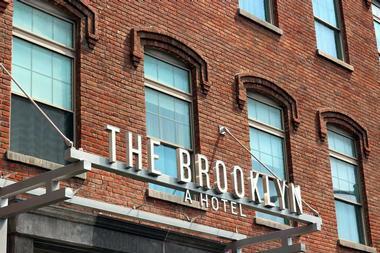 1 Hotel Brooklyn Bridge is a pet-friendly hotel. Located in a converted 19th century warehouse, immersed in the Greenpoint neighborhood industrial vibe and surrounded by film stages and production offices, Henry Normal Hotel offers 50 electric rooms and suites with hardwood floors, coffeemakers, mini-fridges, 42-inch flat-screen TVs, free Wi-Fi, iPod docks, and local art. Some rooms have terraces and suites have sitting areas, while some have kitchens, extra bedrooms, or roof decks. 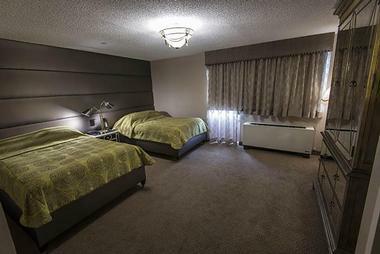 The hotel guests have access to laundry facilities, a sauna, business center, and a fitness room and car service. The hotel is located close to the lovely Msgr. McGolrick Park, perfect for taking a stroll through the shady lanes, relaxing on benches under the majestic trees, or taking photos of the historic bandstand. 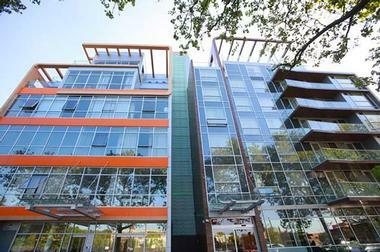 Located in Brooklyn’s Greenpoint neighborhood, Franklin Guesthouse is in the heart of everything Brooklyn has to offer. It also offers easy and quick access to Manhattan – it is located a few minutes from the Greenpoint Avenue G Train station and the East River Ferry. A modern hotel that combines elegance with modern industrial design, Franklin has 30 loft-style spacious suites, each decorated in an unique style, with the 13-foot high tin-plated ceilings, original hardwood floors, specially commissioned modern art, 43" flat screen TVs, a minibar, free Wi-Fi, and coffee and tea. Guests have access to laundry facility, sauna, and fitness center. Located in North Brooklyn with Manhattan a quick trip over the bridge, The Williamsburg Hotel is an upscale hotel set in the beautifully renovated redbrick building surrounded by bars and restaurants. The hotel’s 150 modern comfortable rooms and suites are encased in Corten steel, brick, and glass and have double-height ceilings, beautiful natural finishes, floor-to-ceiling windows, oak floors, free Wi-Fi, and flat-screen TVs. 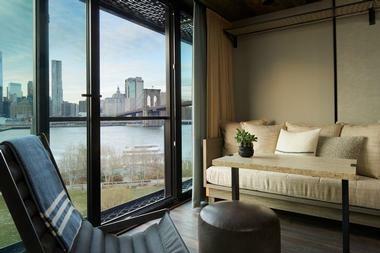 Suites have sitting areas, and some have balconies with fantastic views of the Brooklyn or Manhattan skyline. 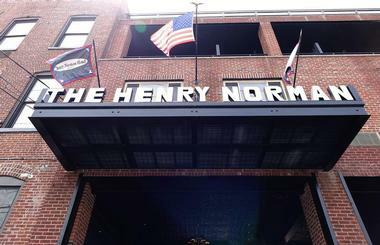 Hotel guests enjoy the spectacular rooftop Watertower Bar, outdoor pool, and café. The Avenue is a seasonal restaurant overlooking Wythe Ave. Guests can use free loaner bikes and an area tuk-tuk shuttle. 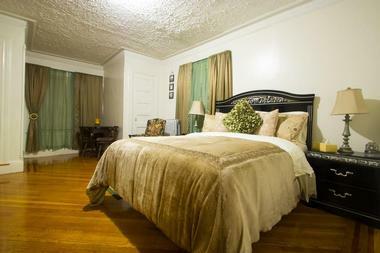 Located in the heart of Brooklyn near Prospect Park, Drummer’s Grove, Lefferts Historic House, and the Brooklyn Museum of Art, A & Faye Bed and Breakfast offers five cozy and comfortable rooms with air conditioning, queen-sized beds, flat screen TVs, Wi-Fi, and private bathrooms with whirlpool tubs. The common area, which overlooks the porch, has a comfortable sofa, a computer desk, and a flat screen TV. Complimentary breakfast offers a range of options depending on guests’ preferences. Staying at A & Faye Bed and Breakfast will make you feel like you are a part of the old Brooklyn neighborhood in a home away from home. Located in Brooklyn’s Williamsburg neighborhood, McCarren Hotel & Pool is a luxury urban retreat and a cool oasis for travellers who are used to the best wherever they find themselves. McCarren offers 64 suites and guest rooms that include luxury amenities such as glass-enclosed rainfall showers, Frette linens, complimentary Wi-Fi, and a flat-screen TV. Guests are invited to enjoy cocktails at the Rooftop Bar, stretch on the pool deck, and try poolside food service or a gourmet Thai meal at the Thaimee. The hotel pool is one of the largest heated outdoor swimming pools in New York City and is a popular local gathering place, especially at cocktail hour. Located in a charming 1898 Victorian brownstone in Brooklyn’s Lefferts Gardens, Lefferts Manor offers upscale accommodation in the heart of Brooklyn, near Prospect Park Zoo and Brooklyn Botanic Garden. The rooms are cozy with charming Victorian touches, original wooden floors, doors and fireplaces, but with all the latest modern conveniences such as walk-in showers, air-conditioning and free Wi-Fi. Beside six rooms in the main house, their accommodation includes such diverse options as Private Guest House with three rooms on Fenimore Street and Full Apartment overlooking the Fort Greene Park. The full home-made breakfast is served in the elegant lounge. There is a small surcharge. The Box House Hotel is located in North Greenpoint, Brooklyn’s industrial chic neighborhood that offers visitors a true Brooklyn experience. 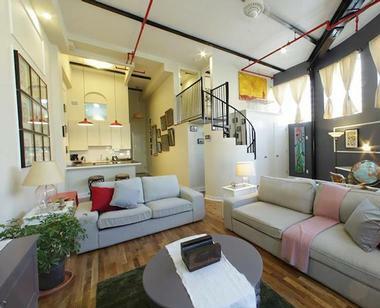 The converted factory and its modern addition have 130 loft-style apartment suites with large windows, high ceilings, fully equipped kitchenettes, brightly colored modern furnishings, hardwood floors, original antiques, and carefully selected contemporary art. Some rooms also have a terrace and spectacular views of Midtown Manhattan and Empire State Building. Guests have access to the fitness center, sauna, and steam showers. The hotel’s in-house restaurant The Brooklyn Lantern specializes in innovative American cuisine, craft beer, and interesting cocktails. The William Vale is a strikingly beautiful modern new hotel in the Williamsburg neighborhood of Brooklyn, just minutes away by ferry or bridge from Manhattan. The views of the Manhattan’s iconic skyline are spectacular from the hotel rooms’ floor-to-ceiling windows. 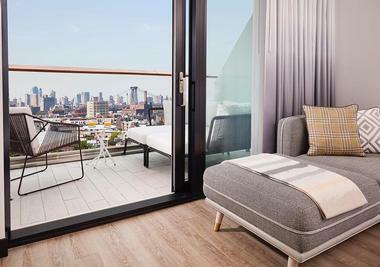 All 183 suites and rooms at the William Vale are offering modern luxury with bright, comfortable beds, furnished balconies, free Wi-Fi, mini fridges and flat screen TVs. Suites also have living rooms, and some even have decks with hot tub. Hotel guests are invited to enjoy a 60-foot outdoor pool, elevated park, an upscale Italian restaurant, and a 22-floor rooftop bar Westlight. 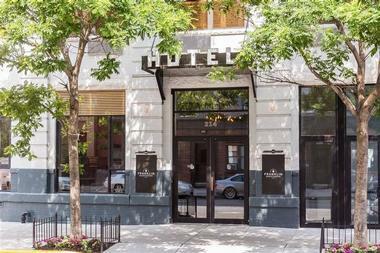 The Brooklyn is a modern boutique hotel located in the heart of Brooklyn, minutes from Prospect Park, Barclays Center, BAM-Brooklyn Academy of Music, and a short hop by bridge or ferry to downtown Manhattan. 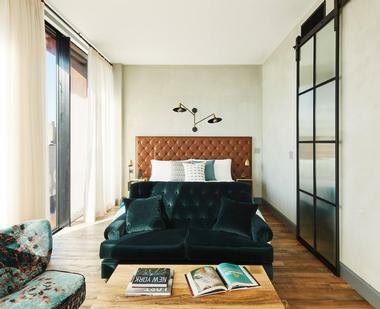 Set in a carefully renovated redbrick building, the hotel’s quirky rooms combine industrial chic details such as exposed-brick walls and reclaimed-wood with modern amenities such as free Wi-Fi, laptop safes, flat-screen TVs, microwaves, Nespresso machines, and mini fridges. They are decorated with striking original black-and-white art. Suites also have sitting areas and pull-out sofas for additional sleeping. Guests enjoy continental breakfast offered in the airy, bright dining room, coffee in the lobby, an exercise room, and a store. 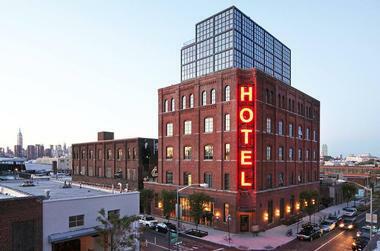 Wythe Hotel is located on the East River waterfront in Brooklyn’s Williamsburg neighborhood. It was the first hotel in Brooklyn to take advantage of the lively, creative spirit of the previously industrial waterfront area. The hotel occupies a wonderfully renovated 116-year-old factory that has been converted to a 70-room hotel with spectacular views of the iconic Manhattan skyline from many rooms. The hotel features many original details that set it apart from others: custom beds built using reclaimed pine wood from the old factory ceiling, radiant floor heating, custom wallpaper, locally designed and manufactured furniture, free Wi-Fi, surround sound, 13-foot high ceilings, flat screen TVs, and specially commissioned original art. Guests can enjoy the 6th floor Rooftop Bar, Screening Room, free access to the Brooklyn Athletic Club, the upscale restaurant Reynard, and the rooftop bar The Ides. The Avenue Plaza Hotel is a modern hotel located in Brooklyn’s Borough Park neighborhood, the largest Jewish community in the world. It is within walking distance of many synagogues and a popular shopping center. The hotel’s elegant, traditionally appointed rooms and suites have balconies, kitchenettes, hair dryers, coffeemakers, European-style comforters, Jacuzzis, safes, and free Wi-Fi. There are also adjoining suites to accommodate large families. Guests enjoy a free breakfast buffet, dry cleaning, and laundry service. The hotel is near some of Brooklyn and New York’s most important attractions such as the Brooklyn Museum of Art, the Brooklyn Public Library in Borough Park, and the Brooklyn Botanic Garden. 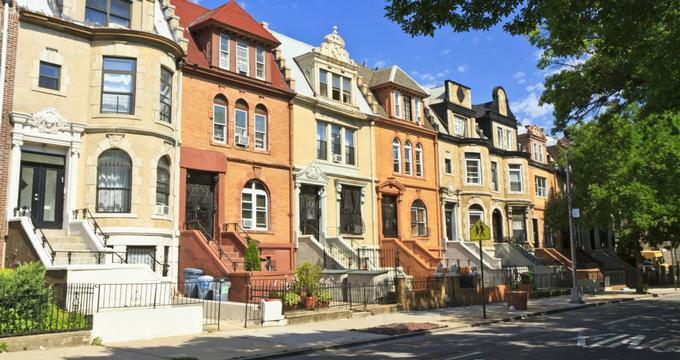 Located in the heart of historic Bedford-Stuyvesant neighborhood close to the Brooklyn Academy of Music (BAM) and Prospect Park and Brooklyn Botanic Garden, Sankofa Aban Bed and Breakfast offers six luxurious rooms in a beautifully restored 1880 brownstone. Most of the historic details have been preserved in restoration when the rooms were brought to the 21st century with all modern amenities. 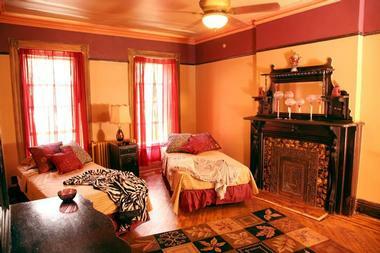 Most rooms have original candlelight fireplace, refurbished parquet floors, and original marble sinks. 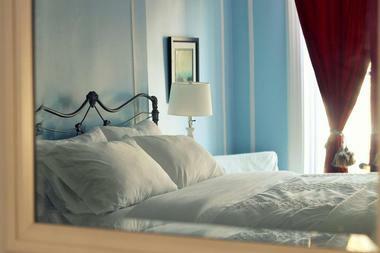 Each room has its own soothing color palette with luxury furnishings, linens, and rugs. Spacious bathrooms are shared, and two of them have chandeliers, a claw foot tub, marble sink, or whirlpool spa. The full continental breakfast includes fresh fruit, smoked salmon, cream cheese, grained breads, and much more. There are no TVs in the rooms to allow guests a reprieve from the hectic modern life.